One of the major attractions for early seaside resorts was the bathing machine, a facility that young children today find quite intriguing. Scarborough was the first seaside resort to have the bathing machines for general use in 1735. King George III used a bathing machine in Weymouth during 1789 and Queen Victoria had her own machine, at Osborne House, on the Isle of Wight. Both of these bathing machines are on display in their respective museums. While we may believe bathing machines were of one particular design, it is true that they were all of wooden construction, with steps, small windows and were pulled into the water by a horse. However, there were, in fact, many different designs, ranging from those for royalty to those basic machines which were to be seen on the majority of beaches. When I first became interested in bathing machines I researched the internet to see if these contraptions existed anywhere else in the world. I was surprised to find pictures and descriptions from as far afield as southern Ireland to Uruguay, Ostend to Australia. As far as the Australian machines are concerned, I have not as yet found any link with the UK, but feel that it may have been a traveller from this country who arrived on a beach and found no such machine in which they could change into their swimming costumes and decided to introduce them to Australia. Returning to Bognor, the town was lucky to have two proprietors of these machines on our seafront, Mary Wheatland and Frederick Jenkins. Many people are aware of Mary Wheatland, who was born in 1835 in Aldingbourne and moved to Bognor and eventually married in 1857. However, this week we will concentrate on Frederick Jenkins who operated from the west side of the pier and who built his own bathing machines at his yard in Longford Road from April, 1905. Thus 113 years ago, bathing machines were being constructed in the town to be used by thousands of holidaymakers. 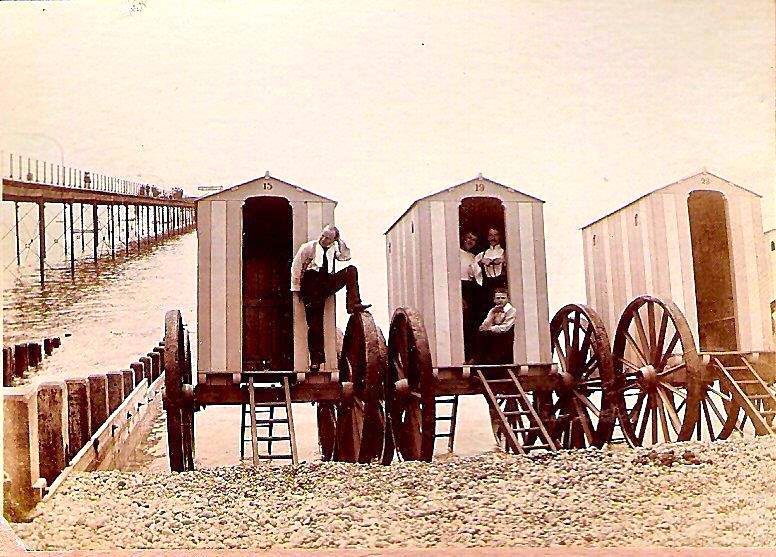 In 1886, when Frederick W. Jenkins married Margaret, he and his new wife decided to move to the growing seaside resort of Bognor, from Eastbourne, where his builder father also operated bathing machines. Frederick also had machines at the end of West Street and a third site at the east end of the parade opposite Clarence Road. During the winter months, his machines were stored in a field at Shripney and would be repainted in their familiar blue and white stripes for the summer months, while carrying out other necessary repairs. The shire horses used by Frederick were named Major, Beauty and Lion and they were stabled in Longford Road. The ticket office beside the pier would open for the summer season from June 1 each year. On each site there was a wooden ticket office where you could obtain towels and bathing costumes imprinted with JENKINS, which could be hired for a few pence. These were rolled together, and stacked on the shelves of the ticket office looking like rows of Swiss rolls. In the early days, they were washed after use in the seawater and dried on the shingle. Later, they were taken back to the builder’s yard where they were washed, put through a big outdoor mangle and hung on lines to dry. While I was researching bathing machines, I was on holiday in Belgium and was very surprised to find that their 100-cent bank note contained a sketch of a bathing machine. This was part of a new series of bank notes in the 1990s. This note was to pay tribute to James Ensor, an Ostend painter, at the turn of the last century. Of course, with the introduction of the Euro, this note is now be destined to one or two copies in a museums. Bathing machines are also used by the Bognor Local History Society as their advertising logo, which can be found on badges and some of the other souvenirs that are on sale today in their museum in West Street. A bathing machine was on display back in September, 2000, during the ‘Sands of Time’ weekend. This machine had been renovated in Eastbourne and it is thought it may have been from a design by Frederick Jenkins, who had arrived in Bognor from Eastbourne. Returning to the bathing machines of Frederick Jenkins, over the years these machines were severely damaged by the constant buffeting of the waves. In 1923, the big machines were replaced by huts which looked like sentry boxes, and the original bathing machines were broken up, with the exception of one, which was retained within the family. This bathing machine is still in existence and is currently being restored. However, during an earlier period of restoration in 1978, this machine No. 23 was found to have the signature of Fred Jenkin’s which stated – ‘April 5th, 1905, F.W. Jenkins’.